Galway East Tourism - Gullane\'s Hotel in East Galway, West of Ireland.Galway East Tourism - Gullane\'s Hotel in East Galway, West of Ireland. 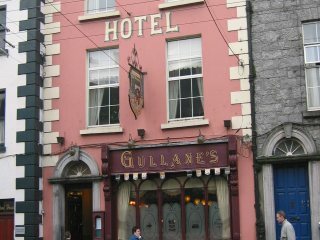 Gullane's Hotel, located in the heart of Ballinasloe, offers comfortable en-suite facilities in all its rooms. A first class service with a personal touch is guaranteed at this family run establishment. Food is served all day. Our spacious rooms are bright, modern and comfortably furnished throughout by our contemporary interior designers. All our guest areas provide the highest level of cleanliness and first class comfort. The wide range of rooms, features and facilities are sure to meet with your approval.